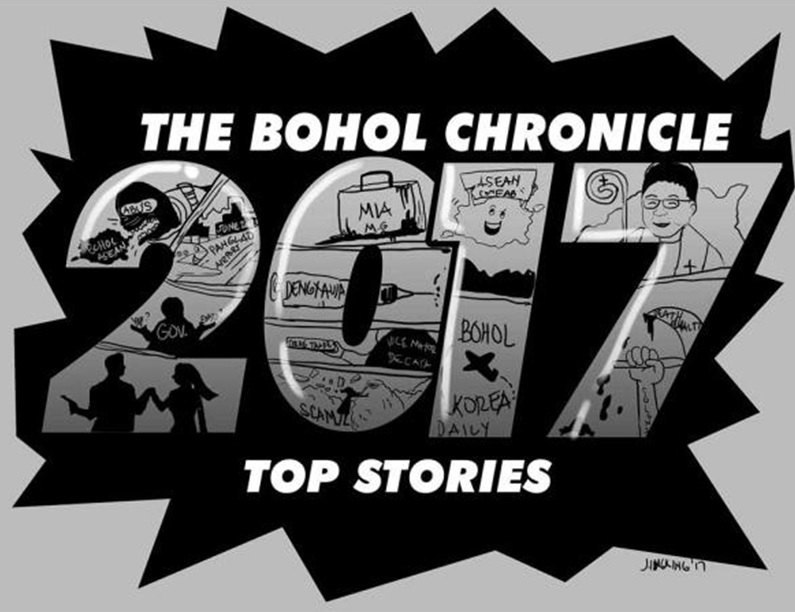 The CHRONICLE voted the bloody but successful repulsion of the Abu Sayyaf Group (ASG) terrorists initiated by a 14-hour gun battle in Inabanga as Top Story of the Year. If the terror strike succeeded- it would have altered Bohol’s history. That would have disrupted the 5 -day scheduled ASEAN Consultative Meeting and made a black eye on Philippine reputation and created another terror beachhead aside from their planned (and executed ) Marawi City assault that lasted months. This would also have fortified the ASG’s image as an ISIS asset in this part of the globe. The United States had earlier warned of a possible terror attack in Bohol and Cebu. The ASG Group brought bombing materials and arms through the 25-kilometer Inabanga River. In a month’s time, a combined aerial bombing by the Philippine Naby Seals and the Army Scout Rangers plus a SWAT team finished off the 10-man group including the heir apparent of ASG head Abu Rami-. Also slain was Boholano recruit (Melloria) with a nom de guerre Abu Alih. As the smoke cleared at month’s end- Bohol was instead praised nationally for a successful government-citizen teamwork that drove the heavily-armed ferocious group into total obliteration. Score 10 for Bohol for this. The fabled P7.8 Billion New Panglao Bohol AirPort Is deemed finished by June 2018 – according to the JAC (Japan AirPort Consultants). This caps decades of endless speculation that It Is just a mirage that will never materialize . In 2oo7 during the time of the late Governor Rico Aumentado under the presidency of Gloria Arroyo . President Noynoy’s wake. It therefore took all of three years to build the runway ,terminals and a housing area that can seat seven major airplanes at a time . As soon as the international airport opens ready to take in a million visitors a year – the city airport will be closed for other business purposes. 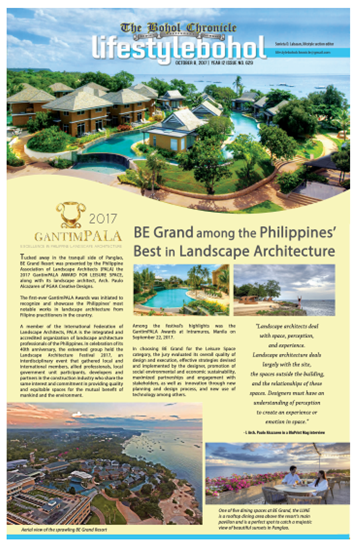 It is a donated property of the Gallares family to the province . Ernesto Pernia was one of the strong forces that moved for the approval of the new modifications of the airport . NO 3. STORY – STORY -EVASCO, YAP TO RUN FOR GOVERNOR? With the May 2019 polls only 16 months away, speculations are rife as to who will succeed outgoing governor Edgar Chatto- Cabinet Secretary Leoncio Evasco or Rep. Arthur Yap of the 3rd District. Evasco’s visibility here fueled speculations he is eyeing the top post -but he denies saying it is only President Digong Duterte who can persuade him to run. Right now, the Maribojoc former mayor who was Duterte’s national campaign manager in 2016 and a loyal aide for 31 years (since 1986) is in charge of 12 important government clusters mainly through his great administrative skills. Among his perceived backers is Boholano Fernando “Ding” Borja, Special Envoy to China, an ally of the president as well who has business interests in Mindanao. Another viable candidate is last termer Rep Yap who is busy as a member of the president’s Economic Team formulating legislation with national impact and attending to his district needs. Yap who joined the president’s PDP-Laban Party continues to radar-track the sentiments of the people before throwing his hat into the ring. Yap has executive experience as a former Department of Agriculture secretary. In what appeared like a sensational family trouble erupting into cinema-like violence, Bien Unido mayor Giselle Sembrano Bendong-Boniel was allegedly shot in the “head while her body was submerged in seawaters” as claimed by two eyewitnesses. The crime allegedly occurred in the early morning of June 7, 2017. Alleged brains and executioner is Board Member and husband of the mayor Rey Boniel who denied the charges even as he is detained facing charges of parricide – with a penalty of a life sentence of 20-40 years. Her body was allegedly wrapped inside a fishnet and dropped with rocks along -within the Olanga channel in the waters of Lapulapu City. Her body was, however, not found. The Church, the Integrated Bar of the Philippines and civil society raised their collective fists in indignation at the shocking murder of a lawyer-CPA inside her own Innova car in front of her traumatized three young children and a nanny. Twenty-seven bullet shell casings were found at the crime of the scene- a cold testimonial that the victim Manuelita “Mia” Mascarinas-Green should not survive that day. “Mia” was also a lawyer for the environment in the mold of Atty Oposa. The ambush done “in military style” along a busy street corner in broad daylight was reportedly perpetrated by main suspects Lloyd Lancer Gonzaga and Romarico Banigan -stemming from a case involving Alona Embrace Hotel for which “Mia” was lawyering in behalf of a relative of Gonzaga. After months -most of the suspects have been caught by the long arms of the law. When the final conviction happens in the face of the supposed influence of Gonzaga is watched keenly by all Boholanos offenses by the merciless killing in front of kids. The DOH (Department of Health) is still determining how many Boholano children and adults were injected with Sanofi Pasteur’s anti-dengue vaccine Dengvaxia starting December 2015. According to Dr. Ria Maslog, president of the Bohol Pediatricians Association, there are 20 doctor-pediatricians in Bohol and some of them were marketed Dengvaxia and then administered them to children since at that time there was no negative notice on the drug. In July this year, Sanofi went out with new findings that those not previously infected with dengue but were vaccinated could, in fact, get the disease instead. This caused a nationwide furor as some 830,000 children were listed as having been vaccinated. It even led to a terse Senate hearing that pulled in even former president Noynoy Aquino whose government implemented the vaccination drive. Bohol was saved from the “massive vaccination drive” due to the fact that it was not listed among the heavily dengue-infected provinces. Government legal eagles are studying whether to file a damage suit against the French drug supplier or ask reimbursement for the P1.4 B expenses and the rehabilitation of those to be affected by its non-disclosure previously. President Digong Duterte’s allegation that government officials and former officials was validated with the conviction of former Batuan Vice Mayor Jaime Ingles Decasa for violation of the ” Comprehensive Dangerous Drugs Act of 2002) caused by a bust-bust entrapment for a shabu sale in cooperation with the National Bureau of Investigation (NBI) sometime in 2004. He was with two other suspects. The decision was penned by Regional Trial Court Branch 4 Presiding Judge Sisinio Virtudazo mandating a life penalty for peddling shabu and the payment of P 500,000. A subsequent raid was done on the place of Decasa which altogether would have amounted to P3.7M in shabu street value. The court, however, dismissed the case involving the house raid deeming the operation as “illegal” which left Decasa partially off the hook. But the buy-bust case was enough for a life term penalty. So young and yet so criminally-minded – was the people’s depiction of a 29-year old alleged mastermind of a swindling syndicate that ripped off P 2-Million worth of merchandise and two vehicles from unsuspecting Boholano businessmen. The youngish alleged scam woman named Felisa Domingo Torralba rented a plush house in Royal Palms I in Panglao and had store outlets in the city to legitimize her trade. After a few successful small deals – the group went in for the kill -buying bulk purchases on credit and then running off with the merchandise after issuing a bunch of bouncing checks. They allegedly boarded a boat to Ubay en route to Nasipit, Agusan del Sur. Despite the scare over the Abu Sayyaf plan to disrupt the activities, Bohol was able to peacefully host a 3-day ASEAN Meet at the Hennan Hotel organized by the Department of Trade. The meet had the heads of the delegates from the nucleus of the 10th ASEAN and Hongkong Free Trade Agreement ( AHKFTA) for the Intersessional Regional Partnership and Negotiating Committee meetings. The ASEAN with 600 million in population is on the cusp of integrating in the mold of the European Union with the view of encouraging trade through lower tariffs also opening in the process employment opportunities and new markets among the members. Bohol was so recognized for the effort that subsequent smaller ASEAN meetings were also held here thereafter. June 22, 2017, was a historic day when the Airbus of the Philippine Airline 320 brought in the first batch of Korean tourists from a direct flight from Incheon International Airport in South Korea, one of the world’s busiest and cleanest airport. According to Emma Casenas, PAL Bohol Manager- this will be a daily flight and will proceed to bustling Clark ,Pampanga. This route is hoped to also bring in visitors from Luzon to Bohol. Bohol recorded local and international visitors at 820,000 in 2016 with 59,000 of them Chinese and 39,000 Koreans, representing the two biggest foreign groups. The Koreans are a long time Bohol friends with some Korean restaurants already sprouting here. One of the 7 Boholano bishops Alberto “Abet” S. Uy is fortunate to be named the 7th prelate of the 75-year old Tagbilaran diocese vice Bishop Leonardo Y. Medroso. Installing Uy was His Excellency Archbishop Bernardito C. Auza, permanent observer of the Holy See to the United Nations based in New York City. The new well-educated prelate ‘s last assignment was as Episcopal Vicar for the clergy in the Diocese of Talibon since 2012. Among the 217 solons who voted for the restoration of the death penalty for heinous crimes were Bohol’s three congressmen: Rene Relampagos ( 1st District), Aris Aumentado (2nd District) and Arthur Yap (3rd District). Yap said based on his social media research 85% of Filipinos were for the restoration to prevent criminality while Aumentado mentioned it is still up to the judge whether to impose a life sentence or the death penalty on criminals.